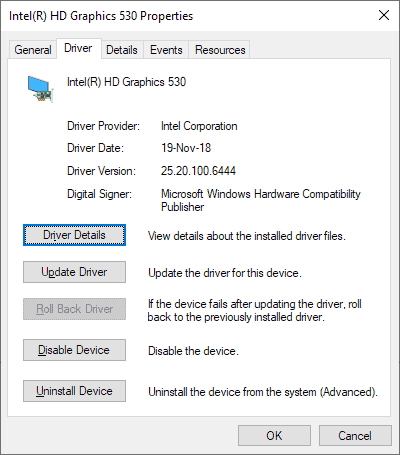 Intel switched the type of driver package that it provides for Intel hardware running on Windows 10 or Windows Server 2019 in November 2018. The new driver package, called Modern Windows Drivers (MWD), is supported by Windows 10 version 1809 and Windows Server 2019, and later, only. The new drivers are available already on Intel's Download Center website and the company's Intel Driver & Support Assistant software. The change should not affect functionality according to Intel provided that system administrators use the provided .exe installer. Intel notes that failure to do so, e.g. by installing using an .inf file, may " result in minor to catastrophic issues or system instability". Downgrading, the process of installing an older driver version, is not recommended either according to Intel as it may also "result in system instability". The Windows Modern Driver requires "an Internet connection for Windows to automatically download the Intel Graphics Control Panel from the Microsoft Store" according to the release notes. Tip: Create a backup of the system before you install the Modern Windows Driver for Intel graphics controllers on machines that support the new type of drivers. If you need to roll back, you may restore the backup that you created to do so. Use a free backup software such as Macrium Reflect, Paragon Backup & Recovery, or Veeam Endpoint Backup. Windows admins should look at the installed driver version to find out if a Windows Modern Driver or a legacy driver is installed on the system for Intel graphics controllers according to Intel. Open the Device Manager on the Windows PC, e.g. by using Windows-X to display the Power Menu and selecting Device Manager or running devmgmt.msc directly. Expand the Display adapters section in the Device Manager. Right-click on the listed Intel graphics controller and select Properties from the context menu. Switch to the Driver tab and note the driver date and version. If the driver data is not November 2018 or later, a legacy driver is installed. If the driver version is 25.20.100.6444 or later, a Windows Modern Driver is installed. Unless you need support for a newly added game, I suggest you wait with the installation of the new driver to find out if the transition is as fluent as Intel says it is or if administrators and users report issues with the driver. Intel switched the type of driver package that it provides for Intel hardware running on Windows 10 or Windows Server 2019 in November 2019. Switched… in november 2019? That’s a year from now (or a typo). How did you manage to install the drivers? Epic, Intel now recommends the most unstable Windows 10 build to install their drivers. Idiots at Intel didn’t mark the driver executable as needing admin rights, so on machine requiring elevation the installer fails miserably – it doesn’t even request the elevation later on. All the other Intel drivers are marked correctly. QA? What’s that? Software’s all about letting your customers do QA. A boss I once had said “Get it out there; customers will tell us if it works! We need speed, we’ll use the software industry model!” Great, except we made surgical devices. Boss went bye bye; dead customers are very expensive. Will these drivers solve the Windows 10 1809 update problem (https://www.ghacks.net/2018/11/22/microsoft-blocks-windows-10-version-1809-for-pcs-with-intel-display-drivers/)? And — should I just wait around and let the Intel Driver and Support Assistant find them (as of today it reports everything up-to-date), or should I try to download? Sorry. I see you’ve already answered my question. “This Windows Modern driver requires an internet connection for Windows to automatically download the Intel Graphics Control Panel from the Microsoft Store”. As one who has long ago removed the Microsoft Store and all apps (modern or otherwise) I fear this cancerous requirement will spread to other video card manufacturers. Having installed v1809 on 5 desk tops and 1 tablet without major problems and being a non-gamer I fail to see any value in exposing well running systems to these drivers. There are several freely available utilities that prevent driver updates if you feel this a concern. Your fears are justified. At one point in time you could install and use display drivers and their accompanying configuration utilities without needing the bloated and insecure turd that is .NET framework installed. But now both NVidia and AMD require .NET, and the latest version, naturally. It goes without saying that Microsoft would love more programs to be exclusive to the Windows Store; they’re probably not above paying developers to make it happen. I use Snappy Driver Install to periodically check my system and tell me which drivers need updating. Have not had any problems with this app (just updated drivers a few days back). I built a server and installed Windows Server 2019 today and I can’t find the drivers for the Intel Ethernet or Wireless Card. Anyone have a link to them? Again, running Windows Server 2019, unable to access internet from machine currently. The Windows Modern Driver requires “an Internet connection for Windows to automatically download the Intel Graphics Control Panel from the Microsoft Store” according to the release notes. The problem is that “Microsoft Store” is not available on Server 2019! So there is no way to get “Intel Graphics Control Panel” on Server 2019!